We are Mid-Coast Maine's premier decoy shop and gallery, featuring our own work and that of over 60 Maine carvers. 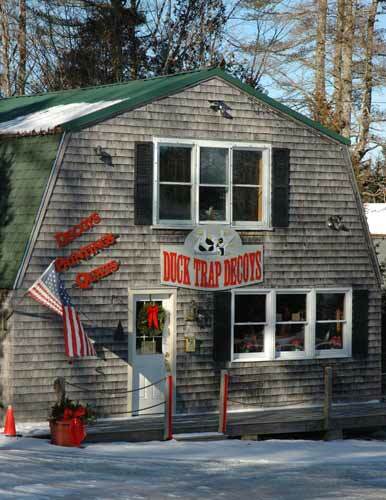 Duck Trap Decoys features the largest selection of hand-carved decoys in the State of Maine-so much, in fact, that we have had to set up this new site for lack of server space. Whether your interest is, realistics or slicks, miniature or lifesize ducks, or wildlife paintings, we have something that should interest you. We and kits so that you can make your own decoys. Of course all of that is available 24/7 on our expanded website. We hear you...You've been asking for more detailed information, that we make it easier to find what you're looking for, and for secure online ordering with real time shipping quotes. Well now you can find all of that and a brand new look over at our expanded site.